Parenting | Lysa TerKeurst For all of their lives, my children have known a secret. When circumstances fall apart, there is a safe place. Their mom’s arms. More than a hug, this place beats with the gentle rhythm of a heart that feels what they feel. So they bring what they can’t bear to experience alone into this place. And we reconnect. With Mother’s Day just around the corner, I’m reminded that this holiday doesn’t always feel so ‘happy’ for each of us. I’m grateful my friend Rachel Wojo understands this and is guest posting on the blog today to point us to Jesus in the moments that might be difficult this time of year. Some days I would pick up the phone to call her, only to realize that I couldn’t. Since Mom had graduated to Heaven, one of my favorite months of the year became the most difficult. May 10 is Mom’s birthday and Mother’s Day is always close to that date. Going to church on Mother’s Day became bittersweet after her death. I wanted to celebrate my children and the joys of motherhood; but I also ached to see my mama. A roller coaster of emotions resulted. After Mom’s death, my daughter, Taylor was diagnosed with MPS at age 4. The diagnosis of a rare, terminal disease was tough enough, but to watch the gradual decline as neurological degeneration occurred was more than I could bear. With the loss of my mother still very fresh, watching my daughter lose her quality of life little by little consumed my heart and soul. At age 6, the loss of cognitive discernment grew more evident. TayTay didn’t sleep well, and when she woke up in the night, she’d play quietly in her room. Some nights, I placed her back in bed so many times that I couldn’t hold my eyes open long enough to walk to her room one more time. So I’d sleep on the floor in the hallway to ensure that she didn’t leave the room or injure herself. Our family worked to make everything as childproof as we could. We moved the light switch to the outer hallway so she wouldn’t play with it. To keep her from harming herself by swinging on hangers and climbing on closet shelves, we placed locks on the closet doors. Then Taylor developed a habit of placing her hands in her diaper. During the day, we kept a close eye on her diapering needs, but at night, it became more challenging. One Sunday morning, I awoke early to prepare for church and before I hopped in the shower, I peeked into Taylor’s room. In spite of my early rising, Taylor had been awake for a while. She had taken on an art project of the worst kind. Because I had been unable to care for her diapering needs instantly, she had plastered the room with poop. The curtains, the walls, the bedding, the carpet, the doorknob, her toys. Everything. I could hardly pull myself together enough emotionally to take her to the bathtub and wash her clean. I opened her bedroom window, closed the door, and took her to my bed to watch TV so I could take a speed shower. All the while, I sobbed and asked God why. Why did we have to go through this? Why did she have to lose her mind? Why did I have to spend the afternoon after church scrubbing down her entire room? And why did all this have to happen… on Mother’s Day? I couldn’t do it. I was overwhelmed on every level and struggled to understand. Why does life have to be so difficult? How did I begin to overcome the overwhelming? How did I begin to work through those hard questions? I discovered that I needed to run to God’s Word when discouragement strikes. If Psalm 18 were written today, it might be known as “David’s Survival Guide for the Overwhelmed.” Take a look at the psalmist’s 6 tips for overcoming the overwhelming. • Recognize that God is your strength. I love you, O Lord, my strength. (Psalm 18:1) Can you repeat David’s praise as your own? • Realize that prayer is your lifeline. • Remember the victories God gave in the past. What has God brought you through so far? • Refuse to focus on personal limitations and believe God will do His redemptive work in you. What personal fears are holding you back from believing God will empower you for His work? • Recall the details of God’s moment by moment provisions. How has God provided protection for you, even in your overwhelming circumstance? • Renew your perspective of the situation. Is your vision limited by failing to recognize his never-ending supply of strength? My perspective of being an overwhelmed mama has changed drastically since that dreadful Mother’s Day afternoon I spent cleaning up poop. I’ve learned that God is my total source of strength and that by continually talking to my Heavenly Father about everything, I will naturally take my burdens to Him as well. When I think about the victories God has given me by providing patience and understanding, I’m stunned by His provisions. I stopped focusing on my lack of abilities to care for a child with special needs and began comprehending that God chose me to be Taylor’s mother. I am the mom He trusts with her unique and precious life. Years after the poopy art incident occurred, more heartache consumed our family when we lost a sweet baby to Heaven just a few months after conception. Like David, we found ourselves in a state of being completely overwhelmed. But that’s why it’s called a survival guide. We’re likely going to need the reminders again and again, right? Two years later, another Mother’s Day arrived and in place of feeling despair, our family experienced delight. This day, May 10, 2009, was not only Mother’s Day, and not only my mom’s birthday, but also a special redemption day. We had prayed and God answered beyond our request or imagination. He ushered a baby girl into our lives on this very day, not only to answer our prayers, but to reveal His incredible power and attention to detail. He redeemed a significant date for our family by allowing Tarah to be born on her grandma’s birthday and Mother’s Day, the very day that I thought I could never be fit to be a mom. We only share the poopy art days to reveal the glory of how He takes the worst mess and creates the best message. How He takes the hard days of loss and balances them with happy days of love. How He loves to take the overwhelmed and transform them into overjoyed. He did it for us; He’ll do it for you too! 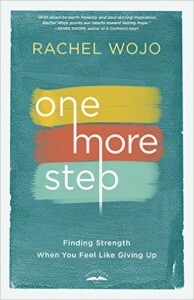 If you enjoyed today’s post, you’ll love Rachel’s latest book, One More Step: Finding Strength When You Feel Like Giving Up. We’ve got 3 copies to give away today! Just leave a comment below to be entered to win.